No matter how much money you actually have in the bank, exclusive credit cards still have an incredible allure around them. While American Express’ Centurion card (aka the Black card) was the first and arguably most renowned exclusive credit card, several more have joined its ranks in recent years to cater for the world’s uber-wealthy. They are nearly always invite-only and offer incredible rewards including free private jet usage, concierge services, gifts and private banking services. Appealing to James Bond wannabes, they come with high annual fees and minimum spending requirements worth of $250,000. They can be used to secure a private jet, rent a yacht at a moment’s notice or drop in the VIP tent at the Monaco Grand Prix. Even the cards themselves are different, made with titanium or carbon or embedded with diamond chips. However, if you want to be a proud card possessor, there is no reason to wait around for an invitation. Simply pursue the list to find a luxury card that fits into your unique requirement. The Centurion Card also known as black card is the world’s rarest American Express Card. Given out by invitation only, it’s believed that those who spend minimum $250,000 to $350,000 each year through their American Express accounts are invited to become Centurion cardholders. Rumoured to be only 17,000 black holders in the world, the most exclusive credit cards stands true for the name. What is Amex Centurion Card and how to get it? I would say this travel credit card is worth each dollar spent. The cardholders earn one point per $1 on all purchases, while you earn fewer points than credit cards in the standard membership rewards program. Not only these, you get wide range of benefits such as automatic upgrades of hotel rooms and flights, plus discounts on cruises and luxury car rentals. Am sure there may still be some benefits that remain to be heard of. The Dubai First Royale credit card can make dreams come true, for those few who qualify. Like the Black Card, this card too is by-invitation credit card with no pre-set spending limit. The most exclusive credit card in the world is available to members of royal family and individuals in ultra-high-net-worth category. Another unique feature which sets this card apart from others is that there are no special benefits for the members. In fact they are customized to suit the needs of each. Cardholders not only get a dedicated relationship manager for financial matters, but also a lifestyle manager who acts as a concierge to obtain almost anything he desires. Want two tickets for the Oscars? Latest Porsche in your mind? Your lifestyle manager is just a call away to arrange all of that! Reportedly only about a few hundred members to the exclusive credit card, it is actually a millionaire’s best friend. Those looking for industry leading perks and rewards without having to wait for an invitation should check out the MasterCard Gold Card. It has the most expensive card design as is made of 24-carat gold. This card is pocket heavy not only because of its exclusivity but also is the heaviest metal credit cards on the market. The high annual fee makes this card an exclusive luxury for those who can afford it. The cardholders can receive services through the Luxury Card Concierge, $200 credits toward flight related purchases including airline tickets, baggage fees, upgrades and more, a “members”-only subscription to Luxury Magazine, and an unspecified luxury gifts. Mastercard Gold is known for its industry leading reward programme. For the convenience of the cardholders, Luxury Card automatically applies the credit to the account. This card is best suited for all travel enthusiasts out there as you receive double points on airfare and a booklet of discounts on flights, hotel and travel packages. A charge card with a high monthly spending limit, Silk opens doors to a world of privileges and benefits. The Silk Card by Coutts Bank in the UK comes with plethora of benefits, making it to qualify on the list of the most exclusive credit cards. As few as 100 people are estimated to own one of these credit cards, which is closely affiliated with the British Royal Family. 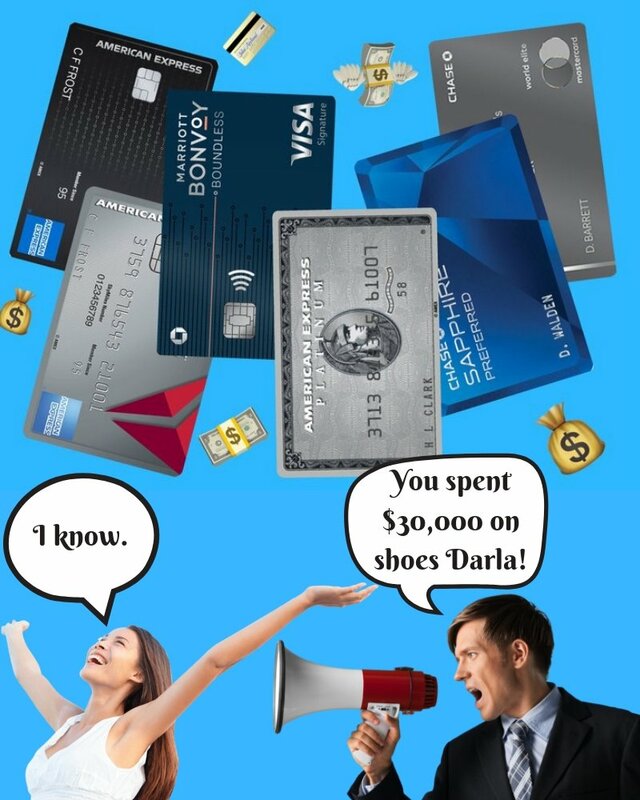 A client would need $1.2 million in disposable cash to own a credit card, but it comes with a 24/7 award-winning concierge service, and access to private shopping at designer stores. Coutts Bank tailors the spending limit of each Silk Card, but a credit line of $30,000 is reported to be the norm. To get the Silk Card, needless to mention you need to be a client of Coutts Bank first. Well, it’s not that simple that it may appear. Opening an account with the bank itself is a tough nut to crack as the guidelines are not been laid down clearly. No one has the clarity on what actually it takes to be Coutts Bank’s account holder. If you still wanna give it a try, visit Great Britain first and open a checking account for more details on it. The Chase Palladium Card, now known as the J.P. Morgan Reserve is intended for ultra-high-net worth individuals. To get an invitation to the card, cardholders must have a minimum of $10 million is assets managed by J.P. Morgan’s Private Bank. The credit card’s standout feature is that it’s made out of palladium and 24K gold – the only credit card to be made of two materials. Cardholder information is laser engraved. The J.P. Morgan Reserve Card awards three points per dollar spent on travel and at restaurants. All other purchases will get you one point per dollar. Chase considers flights, cruise lines, hotels, car rentals, trains and taxis to be part of ‘travel’. Restaurants include anything from fast food to fine dining, cafes, and pizzerias. All of the points you earn are worth $0.015 when redeemed for travel through the Ultimate Rewards website. You can also trade the points in for cashback, though this will get you just $0.01 per point. There are many compelling travel rewards cards on the market, but the Chase Sapphire Reserve Card is a particularly appealing option. The sign-up bonus, points (earning and redeeming) and perks of this card is amazing, and makes it on spot of the most exclusive credit cards. Named the “Best Premium Travel Credit Card” for 2018 by MONEY magazine, a new cardholder earns 50,000 points after spending $4,000 on their card in the first three months; those points when redeemed through Chase Ultimate Rewards are worth $750. Much of its exclusivity comes from the price-point necessary to get in. It has an annual fee of $450, plus an extra $75 for each additional authorized card user. At first, the fee seems quite steep. But when you dig into the benefits the card offers, you realise that even an infrequent traveller gets enormous value out of the card. Another feature that makes The Chase Sapphire Reserve Card stand out is that the annual travel credit is allowed once per cardholder year, and not the calendar year. Because of this, it doesn’t really matter at what point in the year you get the card. Delta Reserve is a card that caters to frequent Delta flyers who are willing to pay a lot to help amplify their status levels. With an annual fee of $95 which is waived off for the first year, and a welcome bonus potentially worth hundreds of dollars, this Credit Card from American Express is definitely worth considering, even if you fly Delta a handful of times throughout the year. The Delta Reserve Card offers something for everyone. For a reasonable annual fee of $450 (plus $175 per additional user), you could join the ranks of cardholders with the Delta Reserve Card from American Express. As the name suggests, this card is very flight-oriented, offering the chance to earn Delta miles for every purchase made on the card from gas and groceries to trips to the Bahamas. There is no limit on how many Delta miles a cardholder can earn, which makes this a very desirable card for those on the go. And no exclusive card would be complete without a concierge service, which is provided 24/7 to Delta Reserve Card users. 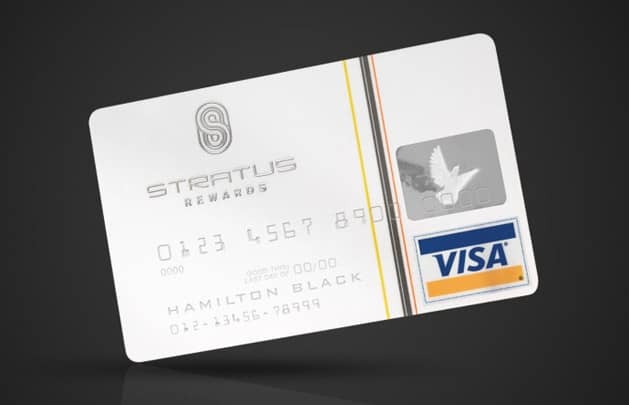 In comparison to the other black and gold cards on this list, the Stratus Rewards Visa stands out in plain white. This card is available only to those invited or nominated to join, and has a very hefty annual fee of $1,500. It isn’t really known what it takes to be a White Cardholder, but for starters, it is available to those who spend upwards of $100,000 annually on their current credit cards. The cardholder earns one reward point per dollar spent with the card, and then redeem them for benefits such as airfare on a private jet. While it can take a long time to accumulate points at just one per dollar spend, Stratus allows cardholders to pool their points with friends and then redeem them collectively. This card is for those who want to fly in privacy and style, with a rewards program that offers private jet flight-time as a redeemable reward. The card offers unique ability to pool Stratus Reward points with friends and other cardholders to use toward flight hours on private jets. Stratus gives you an access to personal concierge services, discounted charter flights, complimentary car services and luxury hotel upgrades, special events and exclusive gift bags. 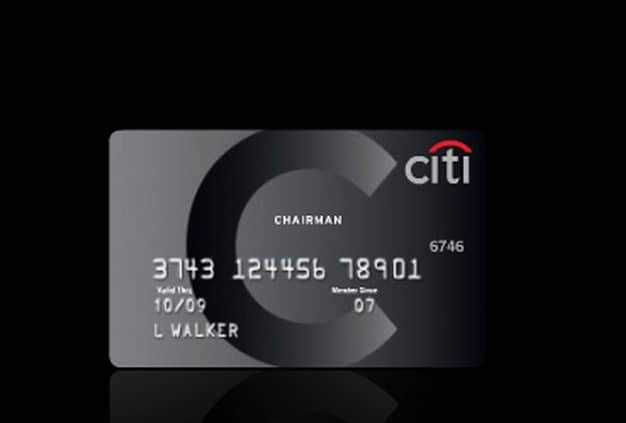 The Citi Chairman Card is Citi’s elite and prestige credit card. It is by invitation only, or rather as Citi puts it, you have to be solicited! This card is reserved for certain Citigroup customers. It offers a high credit limit, travel perks and invite-only events at a relatively low annual fee of $500. When it comes to the most exclusive credit cards, black is the gold standard. And Citigroup has its own exclusive “black card” — Chairman Card from Citigroup. It’s reported to be only for those wealthy individuals who are part of Citigroup’s private banking and investing units. Excellent credit alone won’t get you a Black Chairman Card, but you can definitely apply for one and take your chances. The Citi Chairman Club allows the cardholder to earn one point for every dollar that you spend on the card. In addition you earn one point for every mile that you or your partner flies The reward program is based on Citi’s ThankYou Network. This exclusive credit card is rumoured to come with the perks like $300,000 credit limit, 24/7 access to concierge service, Access to airport lounges and travel upgrades and Special access to invite-only events curated for cardholders through Citi Private Pass BEYOND. 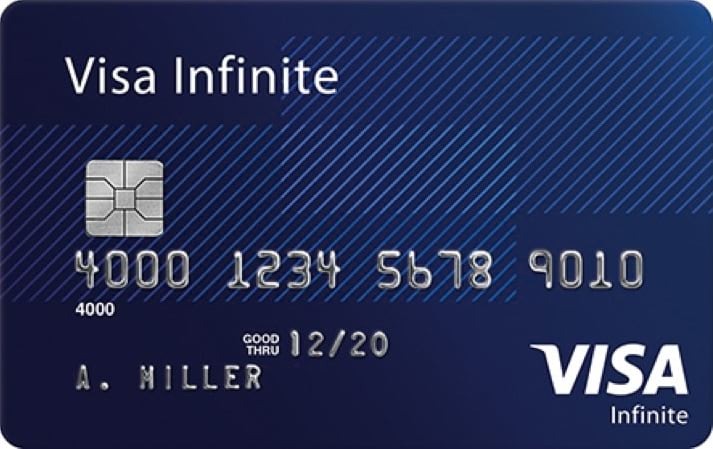 Visa’s Infinite cards are reserved for countries outside of the USA and offer different rewards based on the countries and banks which offer them – all of which are exclusive. The Visa Infinite Card makes it to the list of the most exclusive credit cards because it was created with the wealthiest customers in mind. There are many iterations of the Visa Infinite Card out there from many different card issuers, but they all have two things in common: luxury and exclusivity. While not an invitation-only credit card program, it takes excellent credit to obtain any of the Visa Infinite Cards. The most well-known of these is Sberbank’s limited edition Visa Infinite companion card, which is made of solid gold and embedded with 26 diamonds. The credit card originates from Sberbank-Kazakhstan – a Kazakhstani bank – and provides cardholders with access to a “Sberbank First” personal manager, preferential treatment at some of the world’s best golf course, luxury vacation getaways, and fast-track immigration at more than 280 airports worldwide. Also, the cardholders enjoy above $250,000 life insurance coverage. Estimated to be issued only to 100 of it’s top clients, this Visa Infinite Gold Card costs $100,000 – $65,000 is an account fee, and $35,000 goes to the account’s opening credit.